MANILA, Philippines - When the Samsung Galaxy S6 edge was first introduced earlier this year, it became an instant hit with many smartphone users. Obviously, the premium design and unique dual-edge curved glass display gave it an appeal never before seen in any flagship device. It's also a great conversation starter. The recent introduction of the much bigger and even better Galaxy S6 edge+ puts a lot of stock in the display. A bump in display size from 5.1-inch to 5.7-inch might seem insignificant on paper but it certainly offers better appreciation for the screen real estate. Make no mistake – the curved display was not done solely for eye-candy alone. There’s wealth of hidden features that come along with it, some more practical than the others. Here are 10 really cool hidden features of the Galaxy S6 edge+ that sets this Samsung flagship mobile device apart. 1) Set up quick shortcuts to 5 contacts in the edge screen. The curved edge of the screen offers a lot of really useful features. The entire edge of the screen can be lined with five of your favorite contacts so making calls or sending SMS to this group will just be a tap away. Just go to the Settings menu, select edge screen and choose People Edge. Then, pick the five people in your contacts you want to place in the shortcut menu. The next time you want to call or send them a text message, just swipe your finger from the curved edge of the screen to access them. 2) Add up to 5 of your favorite apps in the edge screen. Pick five of your most frequently used apps and add them as shortcuts along the curved edge of the screen. The Apps Edge gives you quick access to these apps so you can fire them up almost instantly even if the screen is on standby mode. You may also re-arrange them or change the shortcut links anytime. 3) Light Notification on the edge screen. If you're used to the LED light notifications in most other smartphones, the light notification on the edge screen of the Galaxy S6 edge+ bumps it up a notch. Edge lighting will flash colors of light whenever you receive a call or notification. This works nicely when your handset lies flat on its face since you can still see the edge of the screen peeking out from the surface. When configured with People Edge, you can even assign different colors to different contacts so you'd know who's calling even before you check your phone. 4) Activate Night Clock along the edge screen in the evening. Best used in the evenings, you can turn the edge of the screen into a night clock. A small digital clock and date sign will illuminate along the edge of the display. Since the screen uses a Quad HD Super AMOLED display, only the lighted portions of the screen takes up minimal power so you won't have to worry that your phone will run out of battery before you wake up the next day. 5) Get Twitter updates and News feeds straight from the edge display. If you are active on Twitter or follow a lot of news sites and blogs, then you can configure the edge display to show you the latest updates from all your favorite sources. The Information Stream will automatically display alerts from Twitter, stock prices and news websites every time there are new updates. 6) Quickly send replies using the Heart Rate sensor. The built-in heart rate sensor beside the rear camera has many other functions aside from checking your pulse. Whenever you get a call but cannot accept it right away since you're busy in a meeting, just press your finger on the sensor for 2 seconds and the call will be rejected. A preset text message will then be automatically sent to the caller. 7) Use the heart rate sensor as a shutter button. If you take a lot of selfies, then this nifty function with the heart rate sensor will surely be a welcome addition. When using the front-facing camera to shoot photos, just place your finger on the heart rate sensor beside the rear camera and it will double as a camera shutter. Pretty convenient, right? 8) The edge display is for left-handed people too. The Edge display of the Galaxy S6 edge+ can be set so that the notifications can either be displayed on the right or left side. This means even lefties can take advantage of the Edge display features. 9) Voice commands to answer or reject calls. If you are busy or your hands are full, answering an incoming call should be just a voice command away. While the phone is ringing, you can just tell it to pick up the call by saying "answer" aloud or say "reject" if you are indisposed at the moment. This simple feature will surely come in handy more often that you think. While the screen of the Galaxy S6 edge+ is off, just wave your hand over it and the screen will instantly wake up. 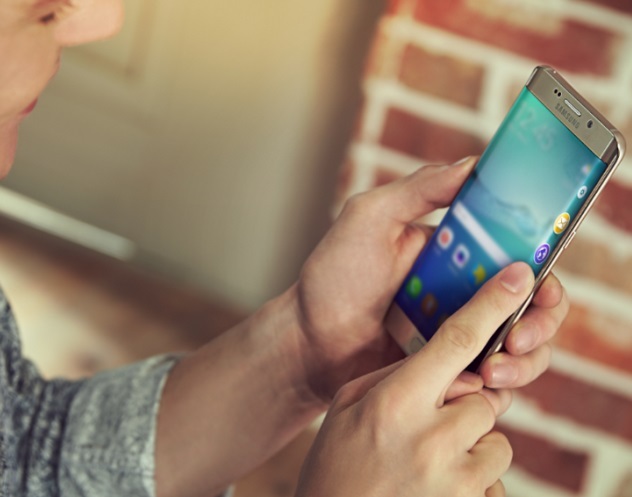 Explore your Samsung Galaxy S6 edge+ and find the features that you feel work best for your lifestyle and needs. Some functionalities may take some time to get used to but once you've given it a try, they will feel like second-nature. If you dig deeper into the settings of the Galaxy S6 edge+, you will find so many more features that you can tinker with. The Google Play Store also offers additional Samsung and 3rd-party apps that extend the features of the device, ranging from camera functionalities to battery performance and display eye-candy. The biggest dual-edge display on the Galaxy S6 edge+ is more than just engineering innovation from Samsung. It's a testament that design and functionality can come together to produce a mobile device that deserves to be called a true flagship.